Legislation to prevent partnerships avoiding prosecution by dissolving has been given its first reading. A Bill designed to close the legal loophole allowing partnerships to evade prosecution by dissolving, as happened in the Rosepark fire in Uddingston, was introduced to the House of Lords by the Advocate General for Scotland, Lord Wallace of Tankerness yesterday (Monday 5 November). The House of Lords gave the Partnerships (Prosecution) (Scotland) Bill its first reading at Westminster. It is the first wholly Scottish Bill to be introduced at Westminster since 2004, making it the third since devolution to have Scotland-only extent. It takes forward the Scottish Law Commission’s proposals to reform the criminal liability of partnerships in Scots law. The issue came into focus following the death of 14 elderly residents in a fire at the Rosepark nursing home in Lanarkshire in 2004. The Crown Office made 3 separate attempts to prosecute those alleged to be responsible but the case failed because of the loophole which prevented the prosecution of a partnership once it had been dissolved. The Scottish Law Commission undertook an assessment of that legal anomaly and suggested a number of proposals to address it. The Bill present a sound, but simple, way to ensure that partnerships - and culpable members - can no longer escape prosecution by dissolving. “I am very pleased the Bill has arrived at this important stage. 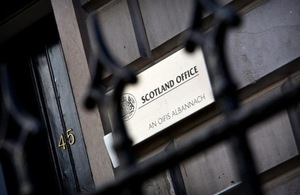 It is the product of much collaborative effort between the UK Government and the Scottish Law Commission. We have also worked closely with the Crown Office who support the Bill. “The Rosepark fire was a terrible tragedy, compounded by the fact prosecutors were unable to find a legal basis to bring those responsible for the deaths of 14 vulnerable people to justice. Closing this loophole is important and it will ensure no one will have to endure the same frustrations as the bereaved families in this case in future. Simply dissolving a partnership will no longer put you beyond prosecution. The UK government began a consultation on the issue of the criminal liability of partnerships in April this year.